One of my favorite pastas during the summer is summer squash or zucchini carbonara and I have long been wondering if a winter squash would work in a carbonara. I recently recalled wondering this and since I had some butternut squash on hand it was the perfect time to find out. When I make the zucchini carbonara I generally like to use penne because it is easy to cut the zucchini into the shape of the penne pasta which works out nicely. Since butternut squash is easiest to use in cube form I wanted to use a pasta that would go better with it and I thought that orecchiette would work well if I cut the squash small enough to be cupped by the little ear shaped pasta. Other than swapping the winter squash in for the summer squash, I pretty much kept the recipe the same, though I did replace the parsley with sage which I think goes better with the squash. The butternut squash carbonara with sage was nice and quick and easy to make and it tasted great! The sweet butternut squash went really well in the creamy sage flavoured sauce and of course the salty bacon rounded things off nicely! I think that I might even like this winter squash version better that the summer squash version and I know that I will be making it again and again. Start boiling some water in a large pot to cook the pasta. Cook the bacon in a pan, set aside and drain all but a tablespoon of the grease. Add the squash to the pan, toss to coat in the bacon grease and saute until tender, about 8-10 minutes. Meanwhile, add the pasta to the boiling water and cook as directed on the package. Meanwhile, mix the egg yolk, heavy cream and parmigiano reggiano in a bowl. Drain the cooked pasta reserving some of the water. Add the garlic, sage and pepper to the squash and saute until fragrant, about a minute. Add the pasta and bacon to the pan and toss. Remove the pan from the heat and wait for the sizzling to stop. Add the egg mixture and toss to coat. Add a bit of the pasta water and toss to mix and coat. Garnish with more sage & serve. My heart just stopped a bit. I want this right now. This sounds really good. Not too heavy either. Umm wow! Basically, I just stalk your site for foodgawking. Thanks for that. That looks so great! I can't wait to try it out. What a beautiful dish! That looks INCREDIBLE. Yum. Great pictures, too. I just ate dinner yet I find my mouth watering over this post. I had to bookmark this as soon as I saw it! What a great way to enjoy more vegetables! Love butternut squash but I never know what to make with it. This recipe looks perfect! Repetition is a basic design principle. Haven't thought to use that with food – matching shapes. Good idea. I shy away from cabonara due to fat content but with some veggies I could justify it! Now that is a gorgeous pasta dish! I'm still loving all the butternut squash recipes – yum! Ummm, scrumptious! All the best ingredients in one dish…looks fabulous! That carbonara looks delicious! A wonderful idea! The colors are absolutely beautiful on this! What a cheerful dish to eat in the middle of winter! Nice! I love the color of the squash. Very summery. This sounds like an amazing combo. Wish I had a plate of it right now! I love the color of this pasta dish!!! Robust and creamy all at the same time!! Really great flavors going here! I am definitely going to give this a try. I think Grumpy would love it too! I can definitely see how this would be delicious. And to think I'm supposed to be weaning myself OFF butternut squash recipes! Carbonara just got more flavorful! Hi Kevin! This looks very flavorful. How the heck do you have such a variety of ingredients? I feel like I make the same things all the time. I would love to take a peek in your pantry! This looks SOO good and I have everything to make it! 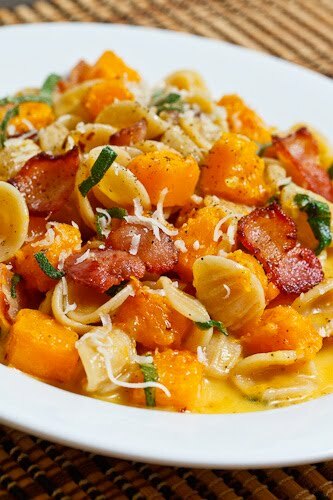 And what could be better than butternut squash and pasta? 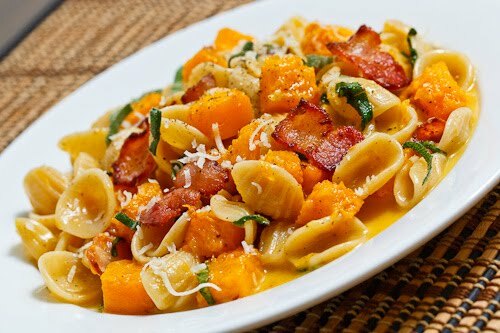 Butternut squash and pasta WITH bacon, of course! YUM this looks so amazing! I love winter squash, will be trying this soon. I would like to eat this straight off of the computer screen. YUMMM! I love using butternut squash with really savory elements like bacon — I think it's such a nice complement to the sweetness. This looks amazing! Looks like it worked! Very creamy and delicious. So I made this recipe. I used cereal cream instead of heavy cream though and it was still good. This dish was every bit as good as it looked, easy too. OMG, Kevin you are a genius. This looks like my idea of heaven! Definitely going on my dinner menu soon. What a fantastic post. I can't believe it took me so long to visit it. The dish is awesome and now I know exactly what to do with the half a huge butternut squash sitting on my counter. Thanks so much for sharing with Presto Pasta Nights. This week I'm hosting and I'd love another Kevin Spectacular for the roundup. Let's face it, we "eat" first with our nose and eyes, and this is just a visual feast. And I love sage with sqush, the flavors go together really nice – I use sage for stuffed squash. Made this over the weekend, and everyone devoured it! Thanks! Made it tonight! YUM. What a nice (and easy) meal for a cold night! Just made a version of this without the egg or cheese which was still so good, thank you for the recipe and for the introduction to sage, a herb I've never used before. Thank you for a fabulous recipe. Made it last week, and my husband said, "You can make this ANYTIME you want!" 🙂 A big hit! Do you cook the squash in the pan or are you using already cooked squash? Christine: Good catch! I have updated the recipe. Thanks! I made this tonight and it was delicious! Thanks for a great, simple recipe! I noticed that the recipe didn't state when to add the bacon back in, so I stirred into the pasta right at the end. Yum Yum!